13.11.2015 BeOnQ at Slush 2015! 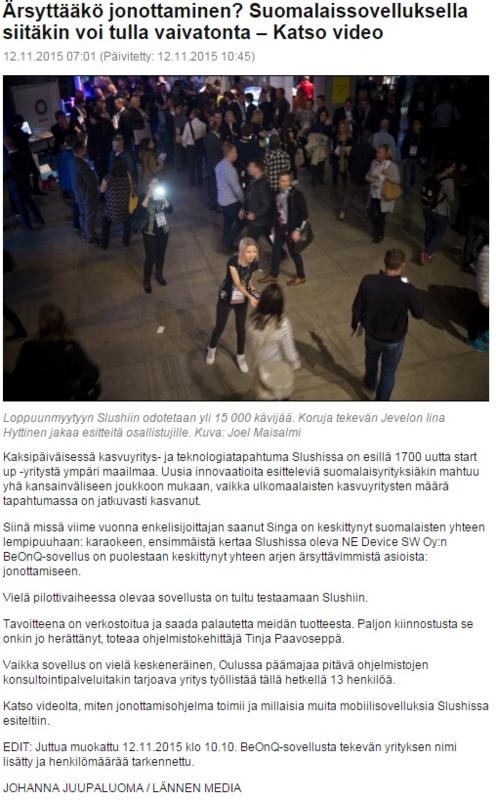 We introduced BeOnQ in the fantastic Slush 2015 conference in Finland! We are still buzzing from the great feedback at our demo stand! And in a sea of start-ups and demo stands, we made an impression on the media! 4.11.2015 Meet us at Slush! We will unwrap BeOnQ at Slush on Nov 11 and premiere the live demo of BeOnQ! Please come and visit us in EXPO Hall 7 at stand A30 and you can win a prize by joining our raffle! 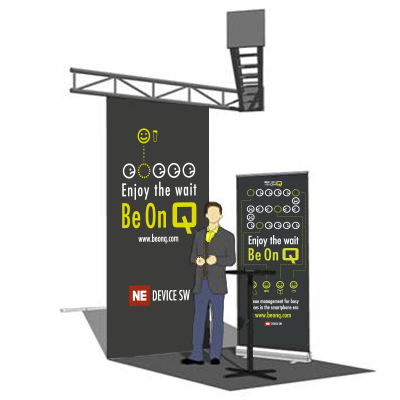 4.11.2015 Queue management for busy places in the smartphone era! We've all experienced long waits and queues at banks, hospitals and public offices. At the tax office, a long queue often means a wait for over an hour. Valuable time when you could be doing something else. Like running an errand or doing some shopping. In the hospital, you can't escape the waiting room, even to go to the toilet, in case you miss your slot! We figured there must be a better way to wait. Many of us have smartphones and many busy places have appointment systems or legacy queueing systems. So why can't we be better informed on our place in the queue so we can make better use of our time? Why wait when you can be on cue? During the last months, we learned that a poor waiting experience is damaging for the service provider. So we have worked hard to build a solution that helps solve business problems of wastage and inefficiency, as well as improving the customer experience. BeOnQ - Enjoy the wait!